Plitvice Lakes National Park is a special geological and hydrogeological phenomenon. Plitvice Lakes complex were declared a national park in April 8th 1949 years. 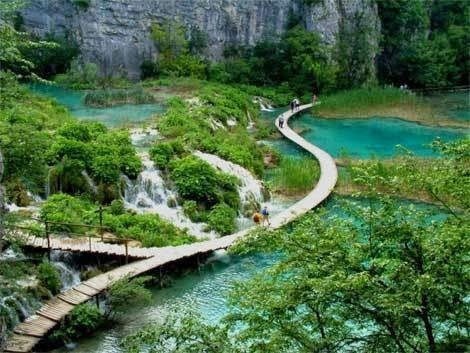 It is the largest, oldest and most popular Croatian national park. Represents an area of ​​wooded mountain with a chain of 16 lakes, large and small crystal blue-green color. Lakes receive water from the many rivers and streams, and they are connected with cascades and waterfalls. Travertine barriers, which are conducted during the period of about ten thousand years, one of the fundamental features of the park. The special geographical location and climatic conditions contributed to the emergence of many natural and rich biodiversity. Travertine sediments are formed from Pleistocene far in sinkholes and depressions between the mountains. Upper Lake in south composed mainly of dolomite, and lower lakes in the north of the limestone. Large forest areas, the exceptional beauty of the lakes and waterfalls, flora and fauna, mountain air, Plitvice Lakes fall colors contrasting forest trails and wooden bridges and more than one party the park, which is a UNESCO World natural Heritage in 1979 was among the first in the world. The park is divided into wider and narrower according to the degree of protection area. It is located in two counties, 91% of the park is in the Lika-Senj, and 7% in the County of Karlovac. The total area of ​​29,685 hectares, including 200 hectares of lakes, forests, 13,320 ha, and the rest is grassland and other areas. The average altitude is 600 m lowest point is 367 m on the Korana bridge, and the highest 1,279 m Seliški on top. Year 2006, there were 866,218 visitors. It is located in two counties, 91% of the park is in the Lika-Senj, and 7% in the County of Karlovac. The park is divided into wider and narrower according to the degree of protection area. The Plitvice Lakes are mostly visited by the passage of Pakostane.